In 1914 Curtiss lured B. Douglas Thomas from Sopwith to design the Model J trainer, which lead to the JN-4. The JN-4 was developed from the JN-2, via the interim JN-3 which had featured unequal-span wings with ailerons on the upper wing only and introduced a wheel-type aileron control system. Redesigned vertical tail surfaces had a fin and rudder assembly with contours which were to be largely retained in the JN-4. The UK bought 91 JN-3s and the US Army two. Several JN-2s were converted subsequently to JN-3 standard by the incorporation of JN-3 wings and vertical tail surfaces and by installation of the 75kW Curtiss OXX engine. Total production was no more than 100, a dozen built at a newly-built Toronto factory. 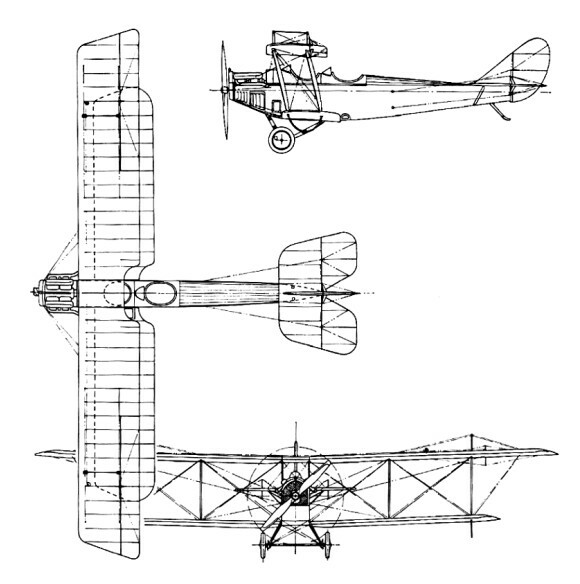 The JN-4 in its original form closely resembled the JN-3, retaining the same unequal-span two-bay wing and cross-axle landing gear. It first appeared in July 1916 when 105 were sold to the UK and 21 to the US Army. Others were purchased by private owners and a number were operated by the Curtiss company's flying schools. As a result of British experience with the JN-3 and JN-4 the Curtiss company developed the JN-4A (retro-designated Model 1 in 1935), which incorporated a number of improvements (larger tailplane and engine downthrust). A total of 781 was completed, 87 of them at the Curtiss Canadian factory. The US Army bought 601, the US Navy five and the rest were exported to the UK. The JN-4B (Model 1A) appeared in late 1916, just before the JN-4A. It differed in several design details (it introduced-the larger tailplane and used the OX-2 engine), and found a number of private purchasers and flying schools as customers, added to which the US Army bought 76 and the US Navy nine. Two examples of the experimental JN-4C were followed by the very successful JN-4 Can and JN-4D (Model 1C). The JN-4 Can had been developed from the JN-3 by the Curtiss company's Canadian associate, Canadian Aeroplanes Limited, and soon became known as the Canuck. Production totalled 1,260 of which 680 went to the US Army while the bulk of the remainder became the standard Canadian primary trainer. The JN-4 Can served with the Royal Canadian Air Force until 1924, while privately owned aircraft remained in use into the 1930s. John Ericson, chief engineer of Canadian Aeroplanes Ltd, assembled 127 aircraft in 1927, most of them reconditioned aircraft incorporating many parts which had been held in stock. Some had a third cockpit and were known under the designation Ericson Special Three. The Curtiss JN-4 two-seat biplane soon acquired the nickname 'Jenny' which was used widely during the inter-war years. It was one of the most significant American aircraft of its time. From April 1917 when the USA entered World War I it was built in large numbers and used to train some 95% of all American and Canadian pilots. It achieved renewed fame from 1919 until the late 1920s, when thousands were flown in the barnstorming era, thrilling spectators at travelling aerial pageants and shows throughout the United States. The JN-4D appeared in June 1917 and went into large-scale production, 2,812 being built between November 1917 and January 1919. With an urgent need for efficient trainers in wartime conditions the production involved six other US manufacturers. The St. Louis Aircraft Corporation became one of six across the country to produce the Curtiss JN 4D Jenny with first deliveries in 1918. The first order was for 200 planes, the company delivered 30 aircraft per month, and 57 JN 4D October 1918. The St. Louis Car went on to manufacture 450 JN-4D Jenny trainers for the U.S. Army. As well as several new features, the JN-4D combined the more successful elements of both the JN-4 Can and JN-4A designs (stick control of the former, in place of the Deperdussin system, and the lines and engine downthrust of the latter). The end of World War I led to cancellation of contracts for 1,100 examples of a JN-4D-2 version, which had a number of modifications requested by the US Army. In the event, only the prototype was delivered to the military authorities, although several were sold to civil operators in 1919. In a bid to provide an advanced trainer to meet urgent wartime needs, the JN-4D was re-engined with the more powerful 112kW (150-hp) Hispano-Suiza built by the Wright company. The resulting JN-4H (Model 1E) was in production from the end of 1917 to the November 1918 armistice, 929 being delivered to the US Army. The JN-4H was completed also in dual-control (JN-4HT), combing (JIM-4HB) and gunnery trainer (JN-4HG) versions. The one-off JN-5H advanced trainer was built to a US Army requirement, but was rejected in favour of the Vought VE-7. It was developed into the JN-6H (Model 1F) which had a strengthened aileron control structure. The US Army purchased 1,035 JN-6Hs, subsequently passing five examples to the US Navy. The aircraft delivered to the US Army were built in sub-variants specialised for various training functions. (JN-6HB single-control bomber trainer, JN-6HG-1 dual-control trainer, JN-6HG-2 single-control gunnery trainer, JN-6HO single-control observation trainer and JN-6HP single-control pursuit [fighter] trainer). With the armistice the production was stopped, after more than 6000 were produced, mostly of the "D" model. As part of the post-war economy drive the US Army was forced to modernize the 'Jenny' rather than purchase new designs. This task was allocated to US Army Service Depots, which upgraded many of the earlier versions until 1926. The revised aircraft all used Wright-built 134kW Hispano-Suiza engines and were redesignated JNS (standing for JN Standardized). Between 200 and 300 JNS trainers were completed. The US Army used JN-4As, JN-4Ds and JN-4 Can primary trainers until 1919. The higher powered JN-4Hs and JN-6Hs remained in service until they were phased out in favour of new types in the mid-1920s, the last Jennies being withdrawn from US Army service in 1927. From 1919 onwards Jennies had been sold to private owners, many who used their aircraft as stunt pilots in travelling circus or barnstorming. The Jenny also featured in many Hollywood films of the 1920s and early 1930s. A considerable number of Jennies survive in museums and several in private ownership are maintained in flying condition in the USA.